As a member of The Cub Club you are eligible for certain benefits. Have you taken advantage of what The Cub Club’s official insurance provider has to offer? Since 1999 Piper Cub owners have placed their trust in Aviation Insurance Resources (AIR). AIR is partnered with all of the major aircraft insurance markets therefore providing the broadest coverage at the best rates available. Furthermore, all of our agents are pilots. Aviation is not just an industry we work in, it’s a passion we share with our clients every day. 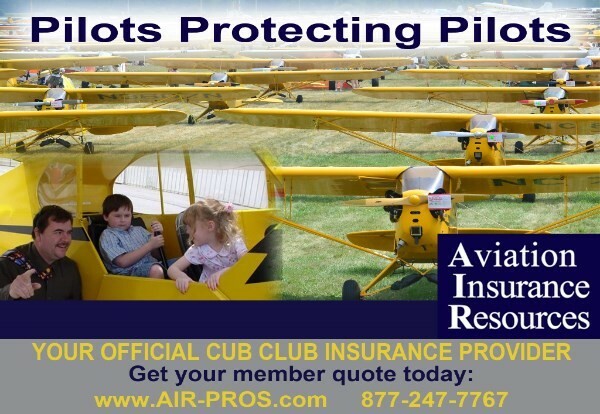 To get started on your official Cub Club aircraft insurance quote please call 877-247-7767 or apply online today and experience the difference! Be sure to mention that you are a member of The Cub Club!